Short post for today... It's time for Beate's Weekend Sketch Challenge. This week is hosted by Lori, who created the sketch - WSC70. I had fun with her sketch and made this very simple card. Hope you have a great day! 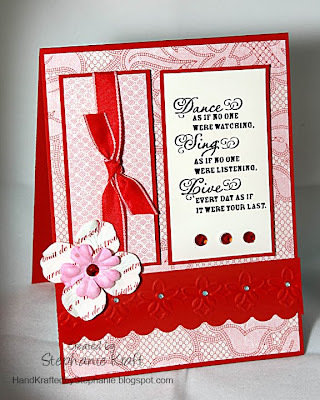 Accessories: Border Frills embossing folder, Cuttlebug (Provo Craft); scalloped sentiment border punch (Fiskars), ribbon (Martha Stewart), flowers (Prima), red rhinestones (Kaiser), tiny rhinestones (CTMH), foam tape.